*April 20 and 21 : ‘All Aboard’ event. Stop by the port and board one of the colorful ‘Pointu’ boat. *June 29-30: ‘All Aboard’ event. Stop by the port and board one of the colorful ‘Pointu’ boat. *August 17-18: ‘All Aboard’ event. Stop by the port and board one of the colorful ‘Pointu’ boat. 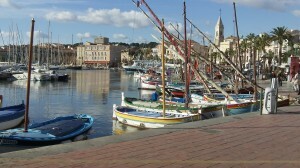 * ‘Pointu’ is the name of traditional wooden boats from the South of France, particularly the Provence Coast region.